Three Texas counties have a model for reform that proves personal retirement accounts are more than just a conservative pipe dream. Stock market volatility remains one of the primary objections to switching from the current pay-as-you-go method of funding Social Security benefits to a system of prefunded personal retirement accounts. However, three Texas counties that opted out of Social Security 30 years ago have solved the risk problem. Galveston County opted out of Social Security in 1981, and Matagorda and Brazoria counties followed suit in 1982. County employees have since seen their retirement savings grow every year, including during the recent recession. Today, county workers retire with more money, and have better supplemental benefits in case of disability or early death. Moreover, the counties face no long-term unfunded pension liabilities. If state and local governments -- and Congress -- are really looking for a path to long-term sustainable entitlement reform, they might consider what is known as the "Alternate Plan." The Alternate Plan does not follow either of the traditional defined-benefit or defined-contribution models. Rather, employee and employer retirement contributions are pooled and actively managed by a financial planner -- in this case, First Financial Benefits, Inc., of Houston, which originated the plan and has managed it since inception. Like Social Security, employees contribute 6.2 percent of their incomes, which the counties match. (Galveston has chosen to provide a slightly larger share.) Once the county makes its contribution, its financial obligation is finished. As a result, there are no long-term unfunded liabilities. Unlike a traditional IRA or 401(k) plan, which account holders can actively manage, the contributions are pooled, like deposits to a bank savings account, and top-rated financial institutions bid on the money. Those institutions guarantee a base interest rate -- usually about 3.75 percent -- which can increase if the market does well. Over the last decade, the accounts have earned between 3.75 percent and 5.75 percent every year, with an average of around 5 percent. The 1990s often saw even higher interest rates, 6.5 percent to 7 percent. Thus, when the market goes up, employees make more; but when the market goes down, employees still make something. This virtually eliminates the risk that a major drop in the market will cause workers to delay retirement. Social Security is not just a retirement fund, but a social insurance program that provides death, disability and survivors benefits. When financial planner Rick Gornto devised the Alternate Plan for Galveston County, he wanted it to be a complete substitute for Social Security. Thus, part of the employer contribution provides each worker a term life insurance policy, which pays four times the employee's salary, tax free, up to a maximum of $215,000. That's nearly 850 times Social Security's death benefit of $255. If a worker participating in Social Security dies before retirement, he loses his contributions (though part of that money might go to surviving minor children or a spouse who never worked). A worker in the Alternate Plan owns his account, so the entire account belongs to his estate. There is also a disability benefit that pays immediately upon injury. Social Security's comparable benefit comes with a six-month wait, and includes other restrictions. • A lower-middle income worker making about $26,000 at retirement would get about $1,007 a month under Social Security, but $1,826 under the Alternate Plan. • A middle-income worker making $51,200 would get about $1,540 monthly from Social Security, but $3,600 from the Alternate Plan. 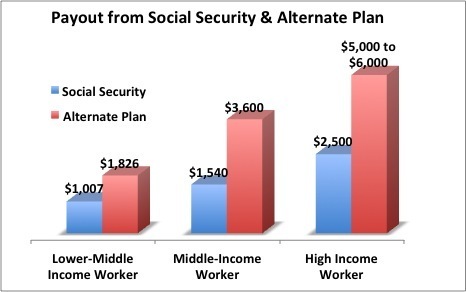 • And a high-income worker who maxed out on his Social Security contribution every year would receive about $2,500 a month from Social Security compared to $5,000 to $6,000 a month from the Alternate Plan. It is evident that higher-income workers fare better, relative to lower-income workers. The reason is that Social Security's payout formula drops benefits for higher-income workers so that benefits for lower-income workers can be raised. The Alternate Plan makes no such transfer payments. Even so, lower-income workers still do significantly better than they do under Social Security's social insurance model.